With tobacco use declining in developed countries, the tobacco industry is shifting its focus to countries with less developed tobacco policies and consumer awareness. 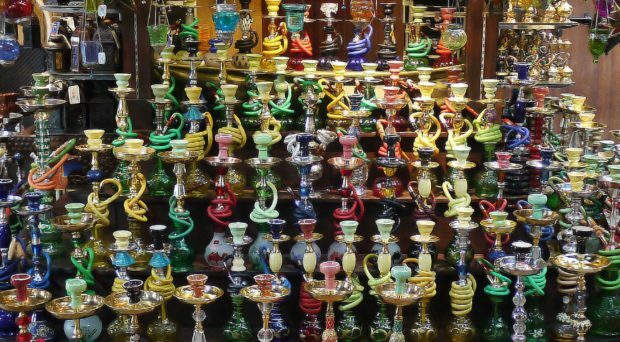 In this blog Christina Banks, author of a research paper published today in Global Health Research and Policy, looks at Egypt and Iran, two countries with vastly differing progress on tobacco consumption and highlights the need for comparing and sharing knowledge and experience. The success of tobacco control measures introduced across many high income countries has been heralded as one of the top public health achievements of the 20th century. Smoking rates almost halved in the US and UK over the second half of the century following the implementation of taxes on tobacco, cessation programs, anti-tobacco publicity campaigns, and bans on tobacco use in advertising, to name but a few policies. Despite the best efforts of Big Tobacco to water down what was understood about the dangers of smoking, irrefutable evidence emerged of the link between smoking tobacco and lung cancer. The tobacco industry has been shifting its focus towards building markets in countries where government regulation and consumer awareness of the risks are lacking. As smoking rates have dropped in developed nations, the tobacco industry has been shifting its focus towards building markets in countries where government regulation and consumer awareness of the risks are lacking. The well-funded promotion of cigarettes and equally aggressive lobbying of law-makers ensures fertile grounds for profits to be made. The effects of tobacco consumption are all the more devastating in poorer nations, where health and social security systems are less well equipped to handle the long term, chronic conditions associated with smoking. Translating what has been learnt from the tobacco control process in developed countries into other settings is key to making an observable impact on the ground across the world. The Framework Convention on Tobacco Control (FCTC), the landmark treaty launched by the World Health Organization in 2003, provides a practical roadmap for countries in tackling tobacco consumption and objectively measuring their progress. This treaty was one of the most quickly ratified treaties in United Nations history and is legally binding in 180 countries. 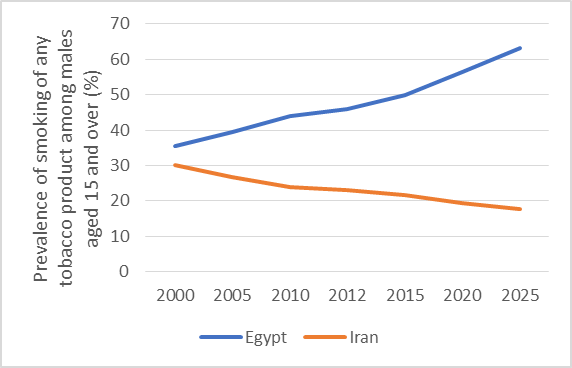 While Egypt and Iran have shown their commitment to the FCTC, and both ratified the agreement by the end of 2005, their smoking rates are heading on opposite trajectories, as illustrated in figure 1, with 63.1% of males in Egypt projected to be tobacco users by 2025. This article sought to untangle the differing progress on tobacco consumption being made in these two countries, in terms of what factors influenced the policy process at the stages of evidence generation, development, and implementation. The comparison of these nations, which have high level contextual similarities in geography, demography and tobacco policy status, but with varying success in containing consumption, allows the identification of common issues and potentially transferable solutions, possibly a more effective exercise than viewing each country in isolation. To illustrate one of the most striking differences: $1.5 million was spent on tobacco control by the government in Iran in 2014 compared to $30,000 in Egypt. Preliminary meetings with experts in tobacco control at the Eastern Mediterranean Region Office of the WHO underscored the notion that the increasing tobacco consumption in many countries of the Middle East is reversible through policy, if governments act assertively and take appropriate action. The literature review uncovered reports of multiple possible influences on tobacco control policy, such as political commitment and cohesion, tobacco industry influence, cigarette smuggling, the lack of an evidence base, and use of the water pipe among other factors. These included issues which affected both countries (lack of nationally representative surveys), and those which were more pertinent in one or the other (e.g. political commitment in Egypt and cigarette smuggling in Iran). To illustrate one of the most striking differences: $1.5 million was spent on tobacco control by the government in Iran in 2014 compared to $30,000 in Egypt. Similarly, Iran employed the equivalent of 20 full time staff on their national tobacco program in 2014, vastly outnumbering Egypt’s 3. If the projections in figure 1 are accurate, the sizeable investment in the effort against smoking is paying off. Each country has its positive experiences and lessons learned to offer. The ongoing public health battle with the tobacco industry is an uphill struggle, and sharing and comparing knowledge and experiences is key in ensuring governments can aid each other in overcoming it. Christina studied for an undergraduate degree in Neuroscience at the University of Glasgow and a Master of Public Health at Imperial College London. Since graduating she has worked in research for Imperial College’s WHO Collaborating Centre and Global eHealth Unit, covering aspects of health systems and medical education.